Another useful thing to note is that this very mixture also is good for meatballs. The only difference, other than cooking method, is that you want to roll the shaped meatballs in breadcrumbs or flour or coconut flour (for you GAPS or Paleo folk) before browning and cooking. Put the meat into the mixing bowl and break it up a bit with a fork. Chop the pancetta or prosciutto hock fairly fine (don’t make yourself crazy, but you don’t want huge chunks running through your finished dish), and dump into the bowl. Chop all your vegetables; put the onion and carrot and celery in the little skillet with the butter and turn the heat to medium low. Once the butter has melted, stir things around to coat everything with the butter and sauté, stirring every few minutes and watching the heat so things don’t brown; you want tender little cubes, not toasty ones, with translucent onion bits. This will take 5 to 8 minutes, depending on how you define medium low and how often you stir. When they’re done, dump into the mixing bowl. While you’re sweating your vegetables, put your cream into a small saucepan and warm up a bit over lowish heat. When it’s fairly warm to the touch, stir in the breadcrumbs and turn the heat off to let the crumbs soak in all that lovely cream while you finish the vegetables. Dump the cream/crumb mixture into the bowl with the vegetables and meat. 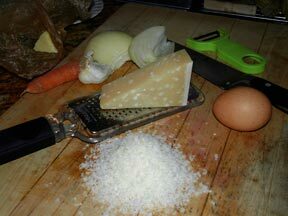 Add the parsley and Parmesan to the bowl, along with a scant teaspoon of salt and a good grind or three of the pepper mill. Stir it all together with the fork. Don’t worry about getting it completely homogenous, just get it reasonably well blended. This would be a good time to smear the bottom of your baking dish with a teaspoon or two of olive or coconut oil, while your hands are still clean. Put the properly smeared dish next to your mixing bowl. 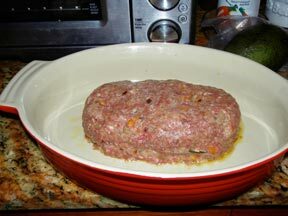 Now make a little well in the middle of your meat mixture, and break the egg into the well. Mix it up a bit with your fork, and then put the fork away to wash – it’s time to get your hands dirty. Mix everything together with your hands, nature’s ideal mixing tool. It won’t take long, but you’ll see how quickly your hands get everything squished and squeeze and smushed together just right. Now start to shape your loaf. Think of a squat little loaf of bread, like a nice plump ciabatta – a rounded rectangle or a slightly squared off oval. Get it roughly shaped and place gently into your prepared bakind dish. Tweak it by smoothing it off, tucking in any stray pieces of the mixture, and in general making it look reasonably photogenic. 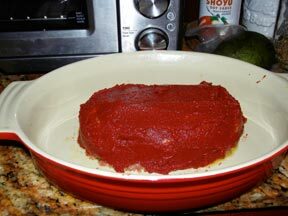 Then frost it, just like a cake, with the tomato paste. Cover the tomato paste with the strips of bacon, put side by side to cover most (if not all) of the surface. Into the oven it goes to cook for 45-50 minutes. When it’s done, it will smell heavenly, the bacon will be browned (though not crispy like pan-frying it), and the tomato paste may have a few light brown patches here and there. Let it rest for a few minutes, then use a very sharp knife to make thick slices (at least 3/4 inch thick). Use the knife or a spatula to lift them gently from the baking dish to your waiting dinner plate and enjoy! Gluten-free/low-carb diet: Use lower amount of cream, and substitute about 3 tablespoons coconut flour for the breadcrumbs. No need to warm first, just whisk together, let sit for 5-10 minutes, then add to rest of mixture. Dairy-free: Substitute full-fat coconut milk for cream and omit the Parmesan. Kosher: Same as dairy-free, as well as omitting the pancetta and bacon. 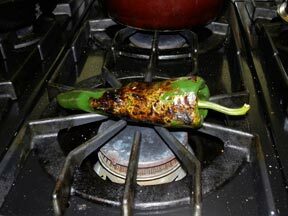 Easy yet fancy variation – stuffed with a roasted poblano chile (pictured): Set a fresh, shiny skinned poblano directly on your gas stove burner over a medium high flame; using tongs, turn once a minute or so to completely char the outside. 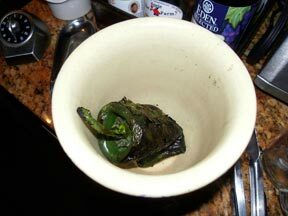 Put it into a bowl with a plate on top and let steam for several minutes; remove from bowl and gently rub off the charred skin. With a small sharp knife, gently cut out the stem with the attached seeds, and cut the chile in half vertically. 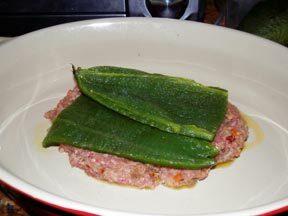 I used half the chile to stuff my meatloaf, so I saved the other half to chop up and add to rice or beans. I cut the half in half again to make two long triangles. 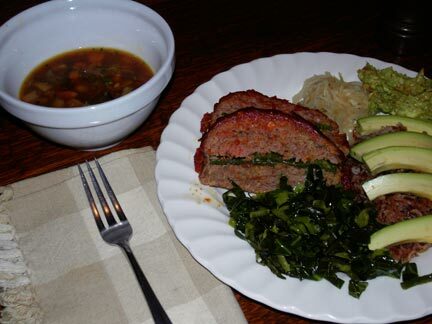 When shaping the meatloaf, I took about half the meat mixture and made a nice oval in the baking pan, then flattened it out gently and laid the poblano triangles side by side on top. Then I took the rest of the meat mixture and shaped the top half of the loaf right over them, smoothing a little meat down over the exposed edges all around. Then I proceeded with the tomato paste frosting. Look how pretty it is when sliced and plated! This entry was posted in Cooking and tagged beef, meatloaf, Parmesan, poblano, recipe by Blochster. Bookmark the permalink. I’m so happy you’ve started a blog. I so enjoy ready your instructions writ in your own voice, re: “in all that lovely cream”, a Victoriaism if I ever heard one!